I hope you all had a nice relaxing weekend! It was so nice to have a 3-day weekend just to spend around here and not have to do too much. 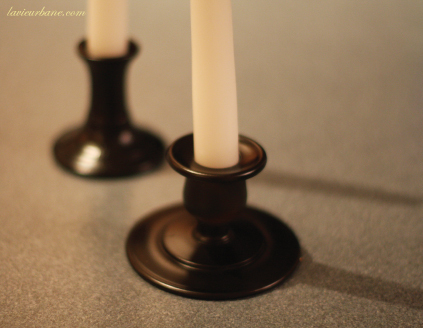 Since I had a little extra time on my hands I finally was able to tackle a small project I have been planning since I spotted these candlesticks in a thrift store down the street. This is probably the easiest craft you will ever find so brace yourself. 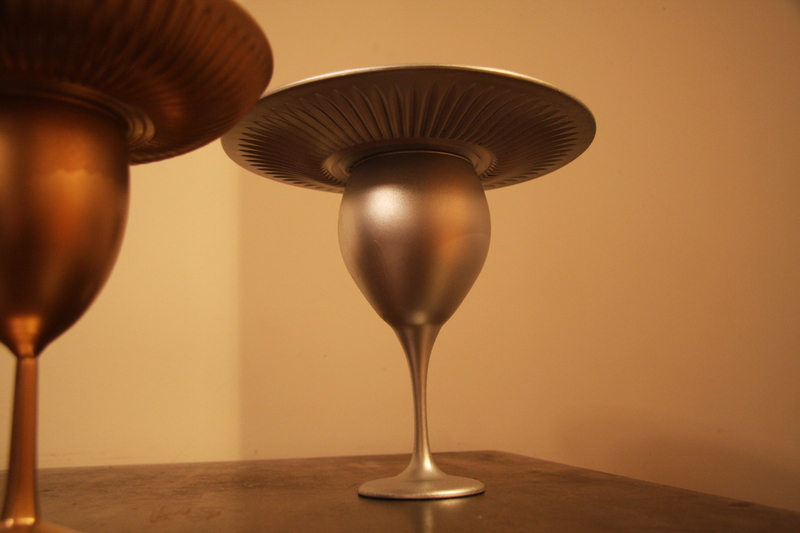 I got the idea after I did this little dessert stand project here. 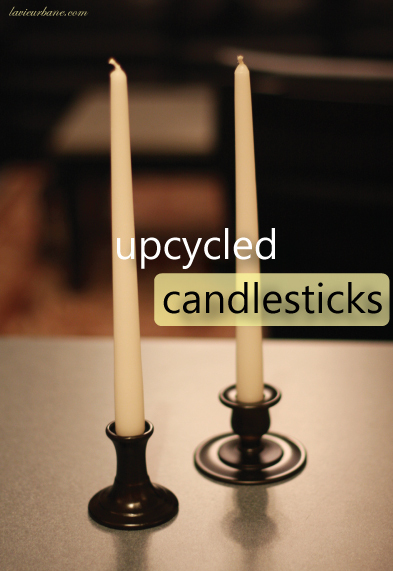 All you need is some spray paint and a few cheap candlesticks! Not super interesting, but I saw their potential 🙂 …I think I spent $3 on both of them so not only is this an easy project, but it’s easy on your wallet too! All you need to do is spray paint them with Frosted Glass paint (after they’re clean and dry of course), let them dry an hour or so (I let them sit a little longer just to be sure, but I’m sure they’d be fine in 20 mins as long as the coat isn’t super thick), then spray paint them in the fun color of your choice! I went with classic black paint since it will match everything, but it’d be fun to do some cute neon colors for the summer… I’ll have to go pick some fun colors up and do more of this 🙂 Candles everywhere!! Happy President’s Day! Since I got to stay home today, I decided to tackle a part of the apartment that might not be noticed by visitors, but one that I notice every single day. 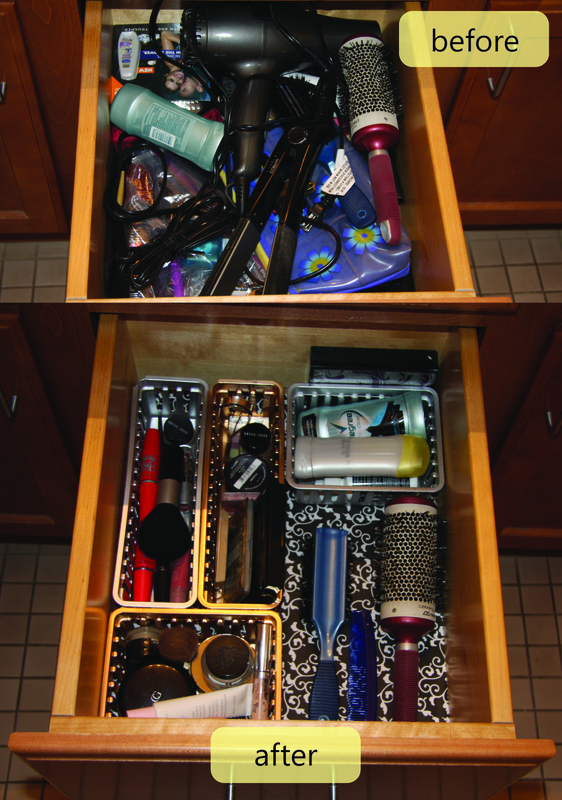 The bathroom drawers! 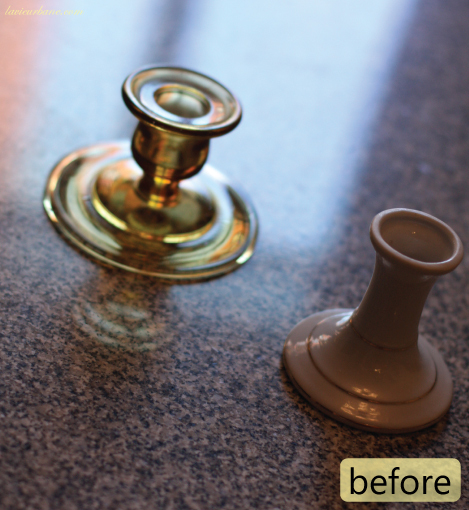 I’ve been putting this little project off for far too long, but I have had a plan in my head ever since I came across Cupcakes and Cashmere‘s blog post Cosmetic Clutter. This did not need to take all day, but between fighting the wind outside while I spray painted, waiting for the stuff to dry, cleaning out my drawers, putting things neatly back inside, and then posting these pictures, I regretfully admit that I have been working on this the entire day with a few little breaks in between. These kinds of projects are a full time job. That’s why I sometimes wish I didn’t have to go to work. I sometimes wish this stuff could be my job. So let’s begin! I picked up some ugly plastic drawer organizers at Wal Mart ($1.50 for a pack of 3), grabbed my spray paint, and got out a few dishes from Ikea that were leftovers from my college days. 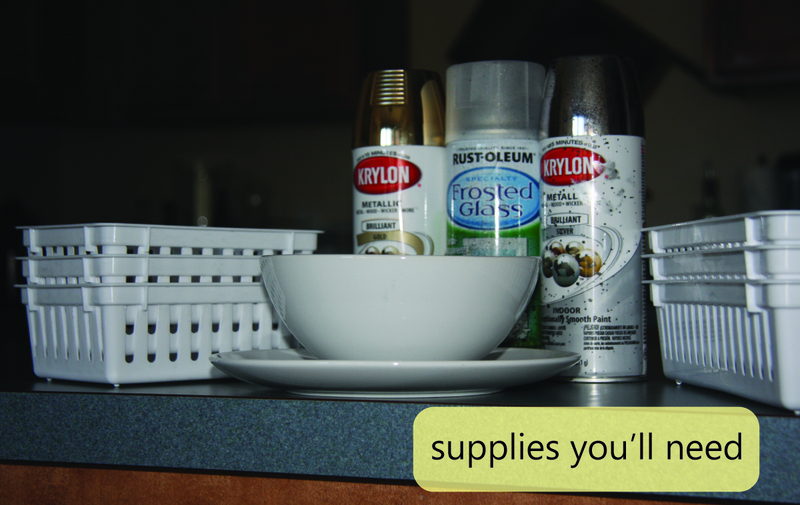 You don’t have to spray paint the bowl and plate if you are happy enough with the plastic organizers. I just wanted to spice it up a little. 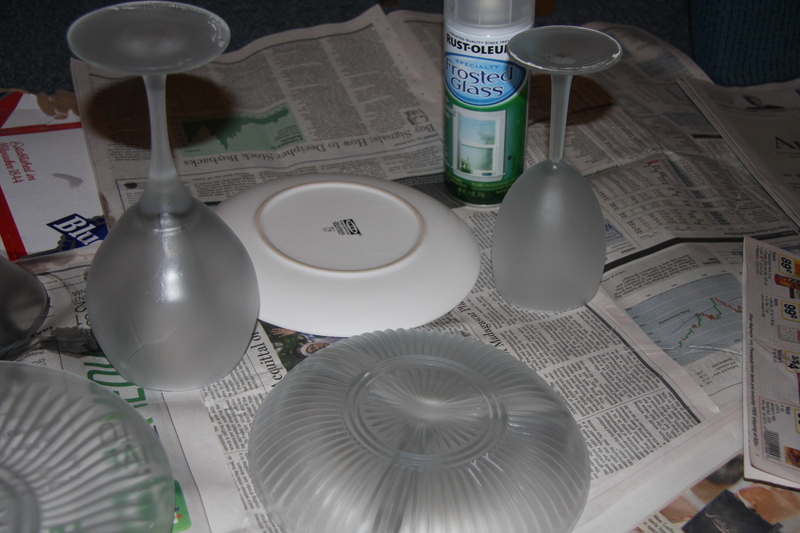 The frosted glass spray paint was only for the dishes. The plastic bins are fine to spray directly with normal spray paint. Just make sure they’re clean before you start. 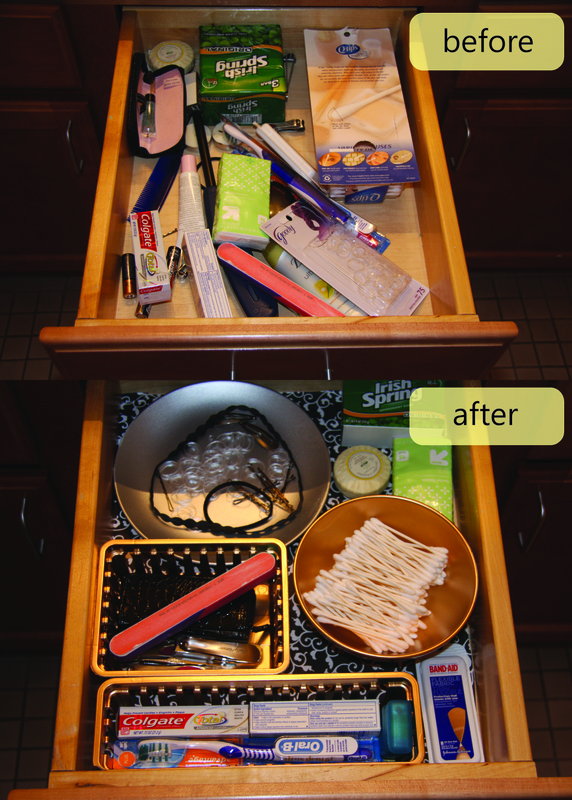 After everything dried, and before I put all my junk back in the drawers, I laid out some drawer liner paper. This process was a little frustrating for me since the paper I used didn’t have a peel off sticky side. I tried to use tape. My advice: Get some real drawer-liner paper. I came across this idea on Centsational Girl and decided that today was the day I would try it. She has tons of awesome ideas, so definitely check her blog out if you haven’t already. Cute, right? 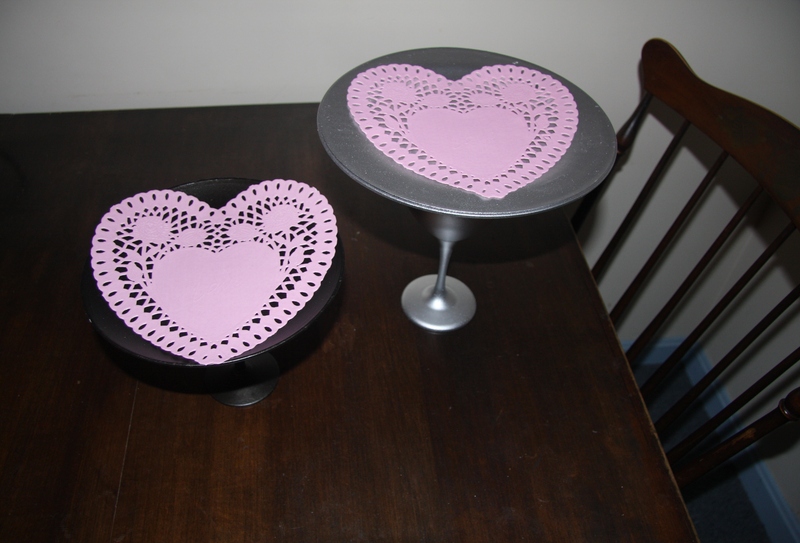 And it’s so easy to find cheap mismatched dishes… whether you go to Goodwill or Dollar Tree (which is where I found mine) or if you have some lying around your house that need some love, this is an easy idea you shouldn’t pass up. Especially with Valentines Day coming soon—you’ll need a cute way to display those sweet little treats. I’ve had a lot of free time this weekend, so I trecked to Home Depot today and bought my supplies. Okay, well, I had to get a few other things while I was there too. Let’s go! 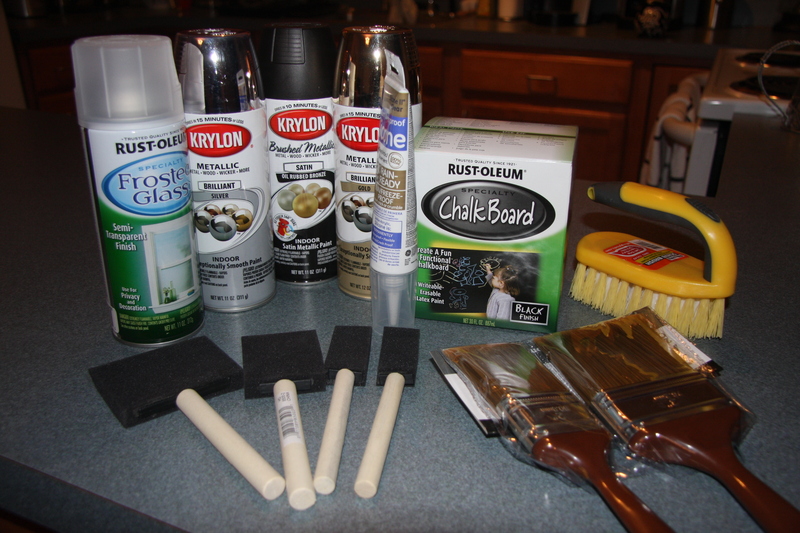 If you haven’t spray painted much (like me), watch this helpful video from Centsational Girl! Make sure you do this in a well-ventilated area (preferably outside) so you don’t inhale TOO many fumes. Get as much newspaper out as you can (more than you think you’ll need) or lay down some plastic. Clean your dishes with soap and water, and dry them thoroughly. Don’t forget to take off sticky price tags if there are any! Start by spraying your dishes inside and out with the glass froster. Hold the can 10-12 inches away and have at it! Once your dishes are “frosted,” let them dry for at least 10 mins. You might have to turn them over and let the other sides dry for 10 mins too. 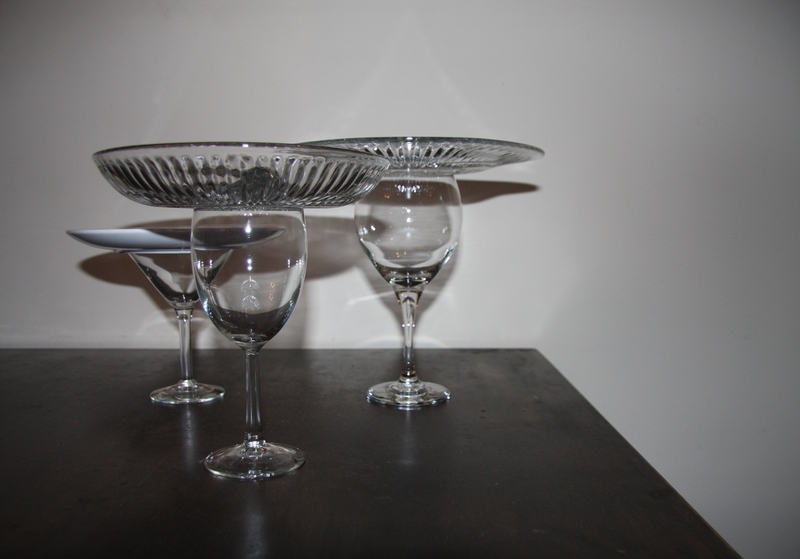 Once you have frosty white glasses & plates, turn the plate upside down and place the glass where you will want to glue it. Try to keep it still while you spray so you’ll have a nice ring underneath that will help you know exactly where to draw the silicone ring. Now grab your colored spray paint and spray spray spray. You might want to do 2-3 coats depending on the look you’re going for. In between coats, turn your plate over and get that side really well. Let the dishes dry for a couple hours before starting step 4. After a few hours, grab your sillicone sealant. 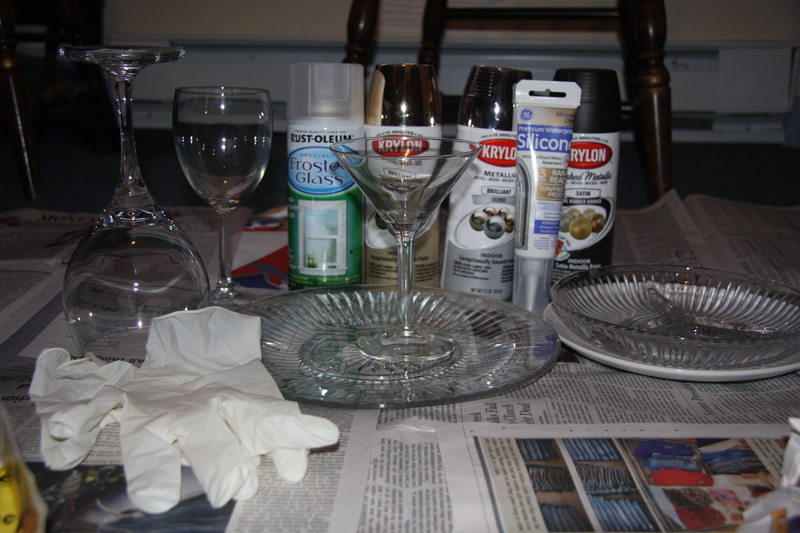 Trace the ring you have on the bottom of the plate with the sealant. 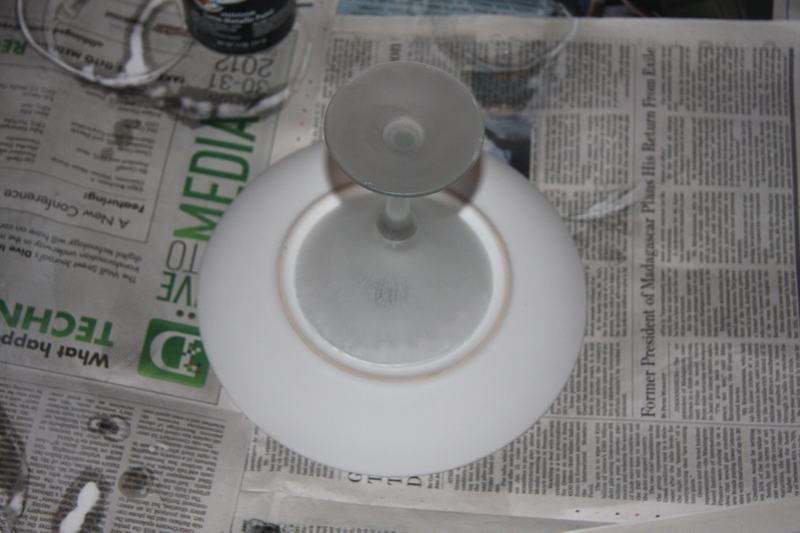 Use a pretty good amount and then smoosh the glass on top of the layer of silicone. 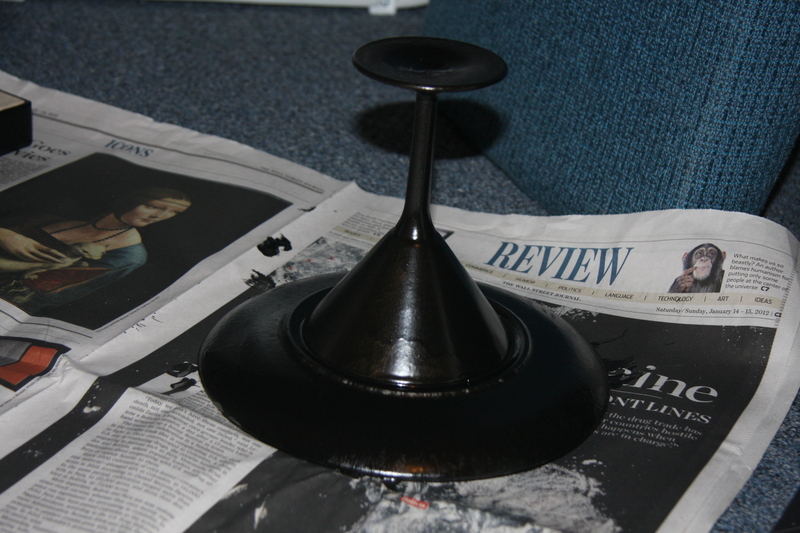 Press down firmly and let dry. Read the instructions to see how long it takes to “cure” but I’d say wait about 12 hours. After that, you’re done and ready to put some treats on these babies! And one last pictures for those of you looking for more Valentine’s Day ideas! 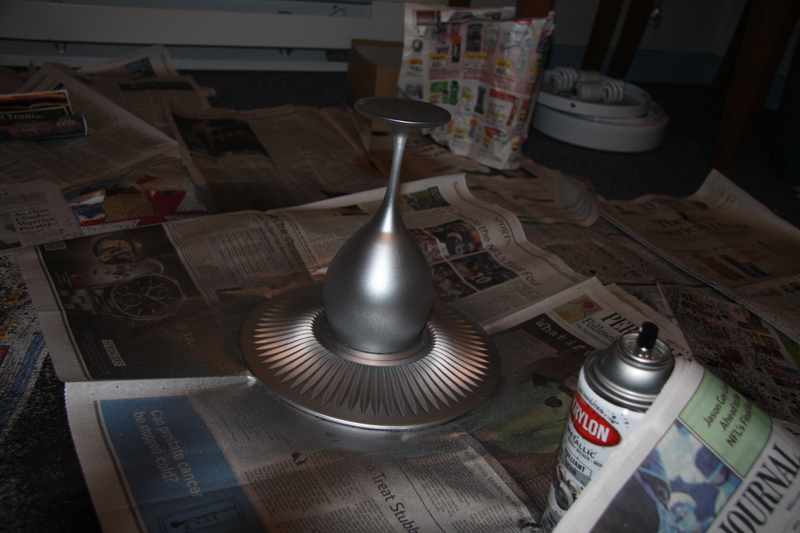 Note: For my spray paint colors I used Krylon Metallic Silver, Gold, and Black. 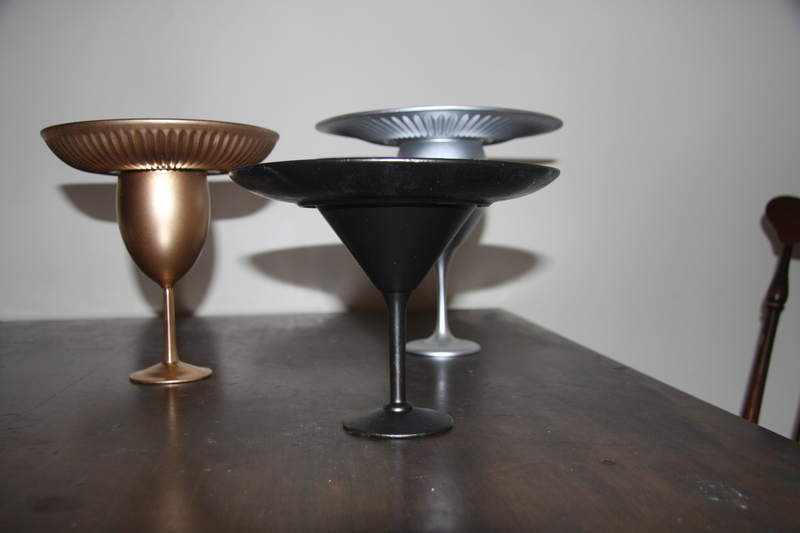 I’m planning on using the gold and silver ones next year for Christmas and New Years!